Every human deserves equal opportunity and treatment to life, liberty, equality and security. Advocating human rights is important in addressing the people’s basic needs (such as food, clothes, housing and education) and protection of their basic rights and freedom from abusive powers. Promising to promote and protect human rights in 10 of its member countries, ASEAN established the ASEAN Inter-Governmental Commission of Human Rights (AICHR) in 2009. Subsequently in 2012 at the 21st ASEAN Summit, the Commission adopted the ASEAN Human Rights Declaration (AHRD) – registering their commitment towards protecting the human rights of its 625 million population. However, the AHRD was heavily criticised for not adhering to international principles – and believed that it would lead to human rights ignorance, rather than protection. ASEAN had always emphasised of being “people-centred”, but its existing human rights mechanism and commitments seem to have reduced the protection capacity of both AICHR and AHRD. The community’s recent human rights standing in regional crisis situations questions the projection of this value (human rights) among all the other “The ASEAN Way”. To invest in a real social change, are we lacking awareness and efforts in the most important feature (the human rights) that ASEAN must pay attention to? 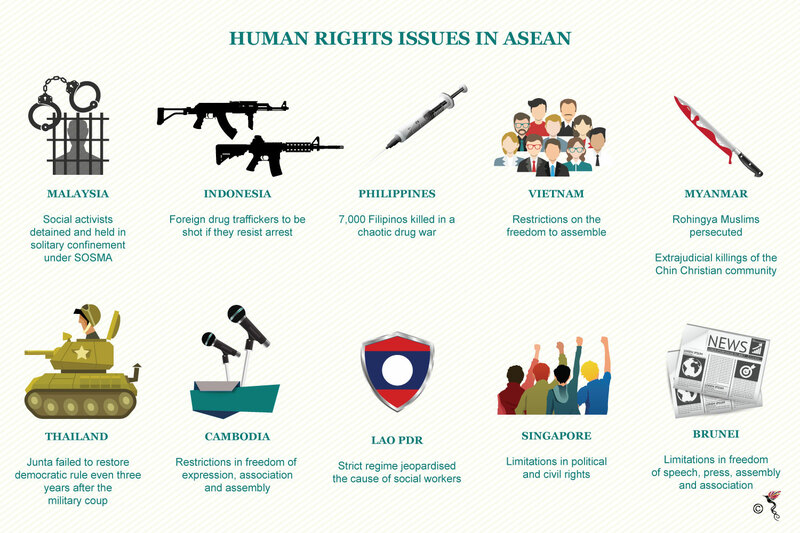 What is ASEAN lacking in terms of human rights? According to United Nations Human Rights Council (UNHRC), the AHRD’s current principles fails to meet the existing international human rights standards (namely Charter of the United Nations, the Universal Declaration of Human Rights, the Vienna Declaration and Program of Action). The drafting process of the AHRD also lacked public consultancy and transparency, and various clauses in the declaration had various loopholes in terms of their fundamental human rights principles. Such matters question the credibility of the declaration. Based on these, the AHRD has been widely criticised by various non-governmental organisations (NGOs) such as the Human Rights Watch, Amnesty International and the Commission for Missing Persons and Victims of Violence. UNHRC calls for ASEAN to revise their declaration to ensure that the ASEAN’s human rights fundamentals maintain international standards to complement UNHRC’s human rights initiatives. ASEAN countries must collectively partner to promote and protect all fundamental human rights and freedoms regardless of their country-specific political, economic and cultural systems. ASEAN has also been encouraged to consult with the people and civil society organisations to compile on their concerns and aspirations in terms of human rights provision – at both domestic and regional level. “The international human rights mechanisms will continue to hold ASEAN member states to their international obligations and encourage ASEAN to strengthen further its regional human rights framework,” the United Nations High Commissioner for Human Rights, Navi Pillay, said in a press release. ASEAN should also abolish its self-imposed rule of non-interference for issues related to the human rights of the ASEAN people. Human rights issues do not constitute border restrictions, but rather encouraging ASEAN to be a caring community across the region. The core issue of political disparity between its democratic and non-democratic ASEAN countries must be addressed. The lack of shared “democratic” values among the 10 nations has lead ASEAN to rather de-promote the protection of human rights in the region. ASEAN has not made much of a progress towards the realisation of human rights though ASEAN-driven initiatives – the AICHR and AHRD. • The escalation of persecution violence against the Rohingya Muslims in Myanmar in 2012 where communal riots broke between them and the Rakhine Buddhists. After the subsequent government crackdown, state-sponsored violence by security forces induced forced displacements of this minority group. Many of the Rohingya fled to neighbouring countries seeking refuge and it became a regional refugee crisis. It drew global attention because the Rohingyas were falling victim to organised human trafficking rings. Many Rohingya refugees either fled to Malaysia by boat, or live in refugee camps in Bangladesh or temporarily placed in Thailand, Indonesia and India. There were also others who spent a month roaming in crowded ships on the seas off the coast of Indonesia, Malaysia and Thailand. Five years fast-forward and the issue still persists. • The extrajudicial killing of the Chin community by the Tatmadaw army and police in Myanmar, due to ethnic persecution, religious suppression and forced labour. The Chin is a minority ethnic group, who are largely Christians. The government also forced them to take up difficult and dangerous job - from road paving to human mine sweeping. This caused many to migrate and seek refuge in Malaysia. From there, they are resettled to the US, Australia, New Zealand, Canada and UK. The migration trip is illegal, dangerous and expensive. Brokers charge a hefty sum to transport the refugees across borders. If caught fleeing, the Chin people faced jail imprisonment or harsh beating. • The Philippines broke into a chaotic, abusive and lawless drug war where 7,000 Filipinos died. Most of them were poor urban Filipinos who are now exposed to summary killings. They were all suspected to be either drug users or dealers and killed by the police because they resisted arrest and shot at the police officers. The police claim they acted in self defense. Part of the killings were also caused by “unidentified gunmen". The existing human rights fundamentals require restructuring if ASEAN aims to succeed as a nation. This human rights regime evolving milestone will help set the manner for ASEAN and its member countries to lead and excel even further in the next 50 years. However, ASEAN will face crucial challenges in revising the AHRD due to the differences in political systems among the member countries. All 10 countries must unite in one voice to achieve a levelled human rights protection across the entire ASEAN. The regional community should not practice having a domestic or regional exception of human rights. The journey may not be a bed of roses, but a change must be embraced in light of improving the various plights of the inflicted ASEAN population. ASEAN recently celebrated its 50th anniversary on 8 August 2017 – in commensurating the establishment of ASEAN half a century ago. Founded in 1967, ASEAN has matured in terms of regional cooperation in areas of economy, politics, social and culture. ASEAN has always stressed on the practice of economic integration, diversity acceptance as well as embracing collective peace and stability advocacy. Now, it is only fair if ASEAN takes a proactive stand in advocating human rights and fundamental freedom to improve the lives of many across all nations under ASEAN – and bring about a real social impact.